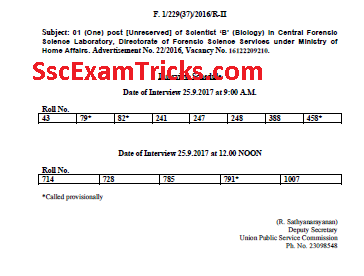 UPSC Scientist B (Explosive) Result 2017 under Advt. 22/2016 Declared - UPSC Junior Scientific Officer (Explosive) Result 2017 Merit List - UPSC Scientific Assistant Admit Card 2017 - UPSC Junior Scientific Officer (Explosive) 2017 available - www.upsc.gov.in. The good news is that UPSC Scientist Grade B (Biology) Result and interview list has been uploaded on the official website www.upsc.gov.in. Those candidates who have appeared in the examination and now waiting for their result; they can download UPSC Scientist B (Biology) Result 2017 from direct link given here. Today, the good news is that UPSC has uploaded Scientist B (Explosive) result on official website. The list of candidates shortlisted for interview has been uploaded. The interview has been scheduled on 09th August 2017 in morning & after noon sessions in two groups. 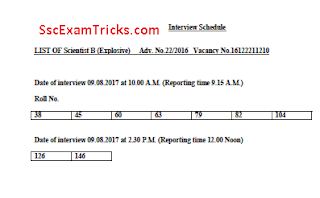 Those candidates who are waiting for UPSC Scientist B (Explosive) Result 2017; they can download it from direct link given at the end of the page. 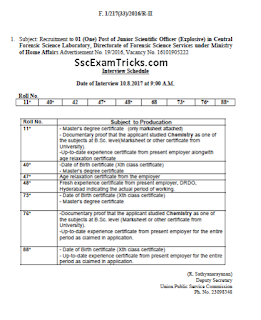 Union Public Service Commission had released notification and invited from October to 10th November 2016 applications for posts of Junior Scientific Officer (Explosive). The selection process will be made through Interview. 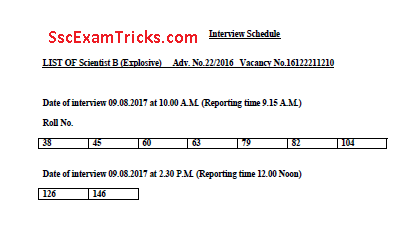 Union Public Service Commission has released Result on 21th July 2017 for Interview to be held on at 2017 various Interview centers for the posts of Junior Scientific Officer (Explosive). Those candidates who had applied for these posts and waiting for UPSC Junior Scientific Officer (Explosive) Call letter they can download it from direct link given at the end of the page. 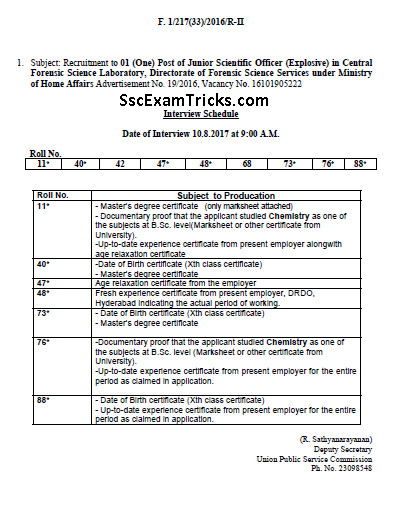 Union Public Service Commission had released notification and invited from November to 29th December 2016 applications for posts of Scientist B (Chemistry). The selection process will be made through Interview. Union Public Service Commission has released Result on 21th July 2017 for Interview to be held on at 2017 various Interview centers for the posts of Scientist B (Chemistry). Those candidates who had applied for these posts and waiting for UPSC Scientist B (Chemistry) Call letter they can download it from direct link given at the end of the page.